Two Confederate flags fly at Nash Farm Battelfield Park during a rally in support of the flag. The volunteer group running the museum is permanently closing its doors after conflict with its County Commissioner, Dee Clemmons. Earlier this year, Clemmons asked for a Second National Confederate flag to be taken down from a flagpole and placed inside the museum. A few weeks ago, Clemmons says she made the request for the group to move a few flags away from a window. The Commissioner says these requests came from her constituents’ feedback, and are part of an effort to make residents feel safe visiting the 204-acre county park. The museum’s board contends the Commissioner asked for all of the flags to be removed and had problems with the meaning of the flags. Despite the he-said, she-said debate on what led to this point, the result is the same: The owner of the memorabilia packed up his things and the farmhouse-turned Civil War museum sits mostly empty. But for those rallying at the farm, the museum’s squabbles are a small part of something bigger. 68-year-old Don Meyer of Conyers speaks to attendees at a rally held at Nash Farm Battlefield Park. The rally wasn’t affiliated with the museum or Friends of Nash Farm, Inc., the group that ran it, so grievances went far beyond local politics. Many of the speakers at the rally expressed frustration against what they say is misinterpretation, misunderstanding and prejudice towards those in the South who fly the flag. 42-year-old Chris Hill is a McDonough native who runs the Georgia Security Force III% militia, and he’s no stranger to controversy. Chris Hill of McDonough (in the black) looks on as Don Meyer of Conyers speaks to rally attendees. Hill said the recent trend of removing Confederate flags and monuments in places like New Orleans doesn’t actually do anything to combat racism. On the subject of racism, almost everyone at the rally strongly rejected anyone and anything that tied the Confederate flag as a symbol of hate. In his experience, Hill has seen people from both inside and outside the South assume anyone who supports the flag is an uneducated redneck, or associated with some type of hate group. Speaking about Dylann Roof, a white supremacist who murdered nine African-American worshippers in a Charleston church and repeatedly posed with Confederate flags, 53-year-old Eric Swilley of Jesup did not mince words. 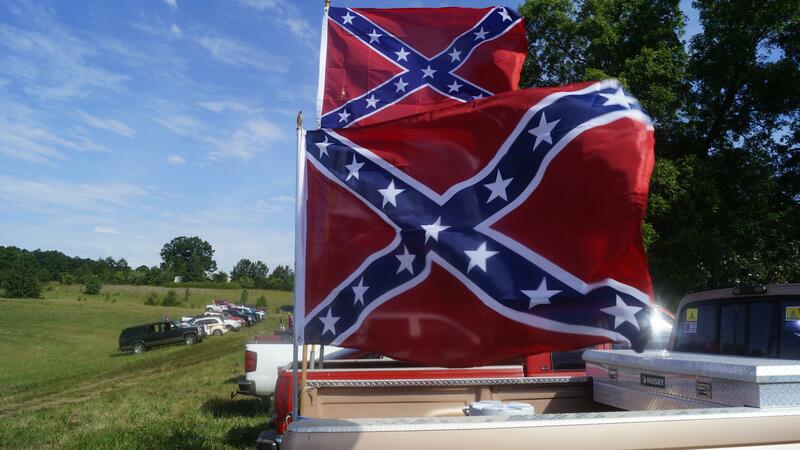 Dozens of flags fly at Nash Farm Park Battlefield during a rally. 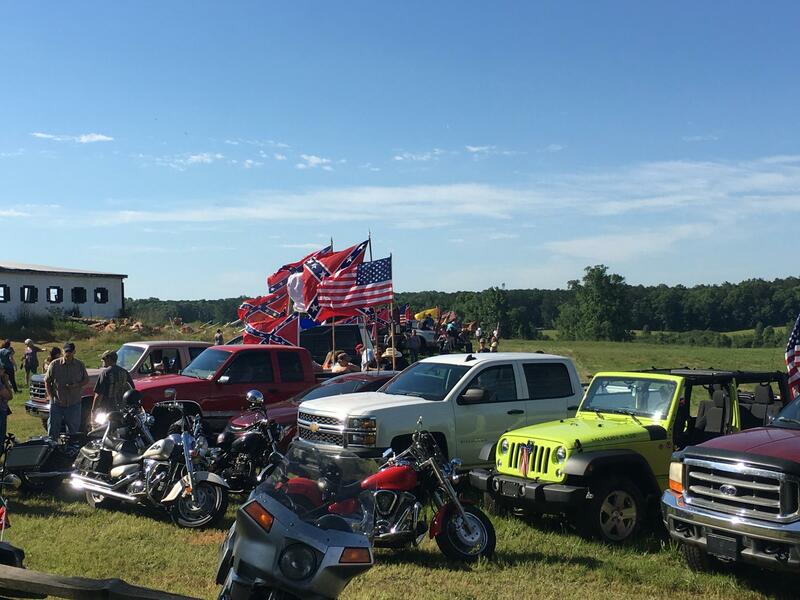 In and around the dozens of cars on the rally field, a colorful array of non-traditional Confederate flags sat on display, ranging from the yellow “Don’t Tread on Me” Gadsden Flag to the III%’s Nyberg Three Percent Flag, featuring the Roman numeral III surrounded by 13 stars, set on the traditional 13 red and white stripes. Over the course of several conversations with attendees, the history of the flag kept popping up as both a sense of pride and contention with the way it’s perceived. What’s commonly known as the Confederate flag was never actually an official flag of the Confederacy, and was actually the battle flag of Robert E. Lee’s Army of Northern Virginia. A 2011 Pew Research Center poll found that 30 percent of Americans felt negatively about the flag, 10 percent felt positive, and 58 percent felt neither positive or negative. The groups most likely to perceive the flag negatively were African-Americans, Democrats and the highly educated. Wes Freeman is a 68-year-old Vietnam Veteran, and one of the last workers who helped create the massive carving on Stone Mountain that’s still alive. The Decatur native said he understands why African-Americans and other people aren’t comfortable with the flag, and that years of people using the flag for the wrong reasons in the wrong way have corrupted the meaning for the rest. Freeman added that the Ku Klux Klan took over the flag’s meaning to the average person, and hate groups using the flag are what has caused aggravation like what happened to the Nash Farm Battlefield Museum. Wes Freeman (front left) and JT Nicholson (center) are two of the people that helped organize the May 27 Confederate flag rally. 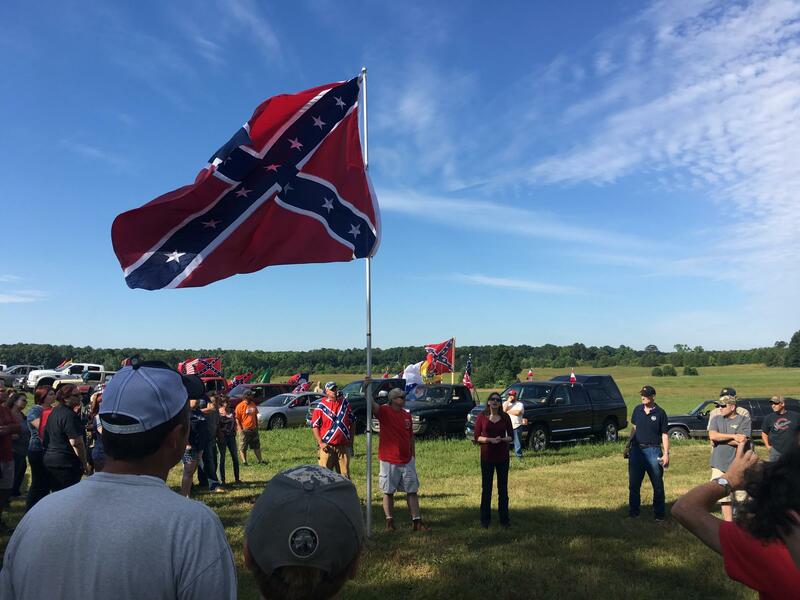 At Nash Farm and beyond, there are people like JT Nicholson who will keep flying the flag and keep trying to push back against what they say is a lack of understanding about the flag’s significance in the South. Nicholson is a 26-year-old from Thomaston who helped organize the day’s rally. He runs a popular Facebook page, CSA flag rally est. 2015, that helped spread the word about the Nash Farm situation. He added that there’s no such thing as repeating the past, except for people who use the Confederate flag for bigotry and fear. As far as the museum goes, Henry County residents are just getting started with their campaign to air their grievances. Since the news broke earlier this week, the Commission has been flooded with letter, phone calls and social media postings expressing dismay (and support) for Commissioner Clemmons’ requests for the flag.